Four years ago, on the morning of Monday, January 8th, 2007, a mysterious foul odor settled upon New York City and surrounding regions, causing confusion, consternation and even building evacuations in some cases. Many were concerned it might be dangerous pollutants, or even possibly a terrorist attack. Soon afterward, some colleagues and I published an editorial explaining a leading hypothesis for the event. I later spent some time digging deeper, seeking to definitively solve the mystery. Here, I’m posting a summary of what I learned, furthering the argument that local polluted waterways with low oxygen levels released sulfurous gases into the atmosphere, to be trapped by low-level atmospheric stratification (an “inversion”). However, to my knowledge, there is still no conclusive proof of what really happened on that foul-smelling morning. A different smelly mystery in New York City was recently solved – specifically, the maple syrup smell that wafted over the city and neighboring regions multiple times over the past decade. Due to the string of events in 2005-7, the city finally formed a crack maple-syrup team that was well-equipped and ready to collect air samples for laboratory analysis. Winds were coming from the west in each case, and the syrup smell was determined to be Fenugreek from a fragrance factory in North Bergen. So why can’t someone solve the mystery of more severe episode that partially shut down the city, the Big Stink? Charles Sturcken, a spokesman for the city Department of Environmental Protection, said on January 9th, 2007, that his agency was “pretty sure” the source of the smell was along New Jersey’s industrialized waterfront, just across the Hudson River from New York. Naturally, a few rounds of noxious finger-pointing ensued. But what was his assertion based upon? 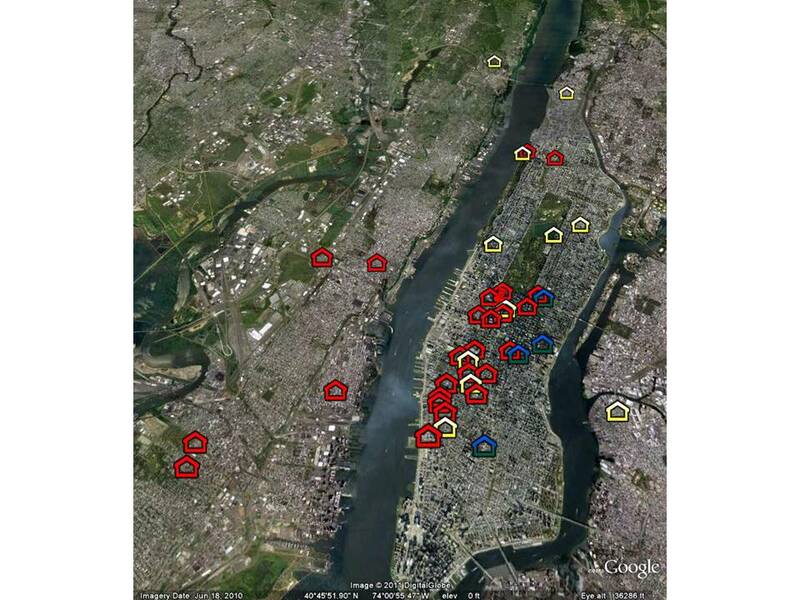 Ideally, one would seek out and map up the over 700 ConEd complaints about gas odors on that morning. But there were also hundreds of online personal accounts – comments that were posted below news stories, mentioning specific locations (some of which are represented in the map below). These “data” suggest that there were bad smells of one degree or another all along the urbanized coastal region from Delaware to Connecticut. There were many people hospitalized in New Jersey across the river, as well as Manhattan, but no reports from Brooklyn. The mapped comments make clear that the smell was bad in midtown Manhattan and across the river in areas like Jersey City and Hoboken, yet there was also a string of reports of no smell on the east side of Manhattan. This map represents a portion of the online comment accounts to the east and west of the Hudson (center) for the time period January 8, 2007, 7:00 – 10:30am. These are divided into red for strong smell accounts (e.g. “strong”, “reeked”, “particularly rank” or building evacuations); yellow for moderate smell accounts or accounts with no description of intensity, and blue for no unusual smell. The Stink doesn’t seem to have been related to the two famously foul-smelling sewage processing/treatment plants in Hunts Point, South Bronx, because the complaint map shows the East Side of Manhattan to have been relatively free of complaints. In my next post, I’ll summarize the weather conditions surrounding the Big Stink — why warm weather may have caused the stink, why the atmosphere capped it, and why the wind patterns make it difficult to know from where it came. This entry was posted in air pollution, water, weather and tagged Manhattan, maple syrup, mercaptan, rotten egg, smell. Bookmark the permalink.